I’ve held off on the latest round of Ghana Tourism Award Ceremonies that have been taking place fast and furious over the past couple of weeks and will continue through to mid December when the national awards will take place. But this post appeared on the SCRAP SHORT TERM TOURIST VISAS TO GHANA page following the Central Region Awards. 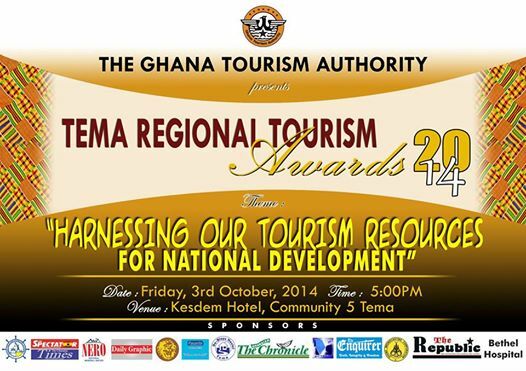 For a long time, the regional tourism awards ceremony has eluded us for reasons best known to our authorities. Fortunately this year, 2014 the prestigious ritual to celebrate and congratulate tourism stakeholders is taking place in all regions in Ghana. The Central Region, which continues to be the “Tourism Heartbeat” of our motherland held the awards night at Coconut grove Beach Resort, Elmina. It is our hope Short-Term Visa for Guest to Ghana will be scrapped or improved to increase arrivals. Authorities, please do something for us. Many thanks to GTA for all the efforts. We know you can still do more. Yes, for six years, 2007 to 2013, no awards ceremonies! In fact the 2007 awards were organized by sectors, not regions. If I remember correctly, it was coastal, forest, savanna, and northern divisions. And then in 2013, only one ceremony was held, THE NATIONALS. Where were the sponsors all those years? And now in 2014, there are eleven regional ceremonies and then a national! Charlene Bello what is the point to awards and awards ceremonies? that seems to be all govt institutions know to do? is the country being run by a bunch of event planners? Ishmael Mensah Though it was organized by a government institution, it was largely sponsored by the private sector. The idea behind the awards is not a bad one. To promote healthy competition which will help improve standards. Christopher Scott Just as long as our tourism levy isn’t going for award ceremonies!!! And give me a break, we are not talking football, we are talking hotels and TRAINING is what improves standards. If anything, the benefits of awards go only to the few winners, for publicity only. And oh yes, to the hotels that host the events. Nice to get a vote of confidence with regard to the Scrap campaign, especially in the context of the awards. If only the Ghana Tourist Authority expended the same amount of energy-and money I would suspect-to marketing and advocating for a more open Ghana.